The new leader of the Scottish Liberal Democrats has signalled a policy u-turn on the introduction of a minimum unit price for alcohol. Willie Rennie said the plan, opposed by his party in the last parliament, was necessary to fight Scotland's unhealthy relationship with drink. He plans to seek the support of party members at the next Scottish Liberal Democrat party conference. The Scottish government has vowed to bring the plans back to parliament. Before the Scottish Parliament elections in May, the minority SNP government was unable to win over the opposition to minimum pricing. But with an overall majority following the election, SNP ministers can push the law through without help from other parties. Mr Rennie, who took over as leader just weeks after the 5 May election which saw the Lib Dems reduced to five seats, said: "Alcohol misuse continues to blight the whole of Scottish society, wrecking individual lives and harming families and communities. "I have seen and heard the terrible impact when I am talking to people on doorsteps. "I believe that radical action is needed and will therefore support moves to introduce minimum unit pricing in Scotland." 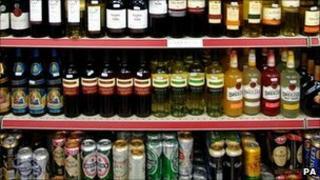 Mr Rennie added: "The UK government has announced plans to ban below-cost selling of alcohol south of the border. "This will not apply in Scotland. "Instead, the majority SNP government plans to reintroduce a Minimum Pricing Bill and I will work positively with ministers on this." The previous Scottish government wanted to set the minimum price per unit of alcohol at 45p. The proposed pricing structure would mean a two-litre bottle of supermarket-brand cider would treble in price from about £1.32 to almost £3.80, while super-market-brand vodka would go up from about £8 to £11.80. Whisky from Asda and Tesco would increase from £9.20 and £9.95 to £12.60, but there would be no change for Bell's, Whyte & Mackay, Famous Grouse or Johnnie Walker, which all currently retail above £14. Since the defeat of minimum pricing in Scotland, the UK government has announced similar plans for England and Wales, under the proposals which would see a can of lager cost at least 38p and a litre bottle of vodka no less than £10.71. And Stormont ministers in Northern Ireland have also backed similar plans, which could bring the cost of the cheapest bottle of wine up to £4.20.